Today Facebook rolled out the Open Graph and their new set of Social Plugins at the f8 conference in San Francisco. As you will see later on on in this post, we believe this is a massively important innovation for the Web and we’re happy to be one of the launch partners that Facebook has been working with. 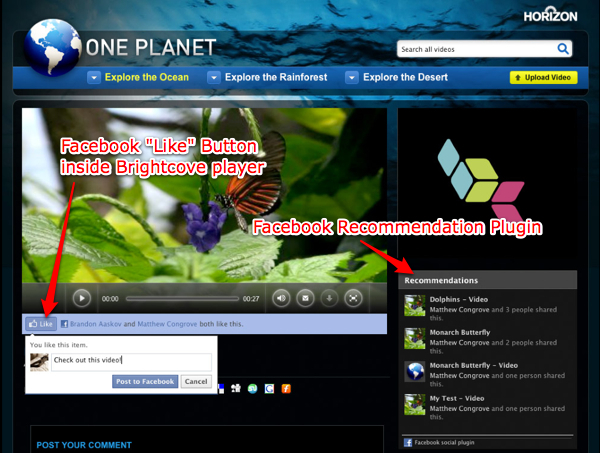 We have created a way for Brightcove online video platform customers to quickly embed the Facebook Social Plug-Ins, such as the “Like” button and the “Recommendation” plug-in into their Brightcove video players using BEML. See "Facebook Open Graph Social Plugins in Brightcove Players" in the Brightcove Developer Center for a tutorial of how to do this. Having this functionality implemented in the player itself is both important and cool because it means that the social plug-ins travel with the video content wherever it goes. If an end-user grabs the embed code and puts it their blog, the social plug-ins will be there. That can accelerate the pass-along effect and enrich the social graph with every click. The secret sauce behind this capability is BEML, the player customization and templating language for the Brightcove platform. BEML makes it possible to skin, extend, and add functionality to Brightcove video experiences without specialized development skills. The new Social Plugins are just the latest of many ways that we've been working with Facebook to embrace social sharing in the Brightcove platform. Last year we put a Facebook sharing control in our default player templates and worked with Facebook to have our players white-listed so that they can appear and play back directly in the Facebook activity stream and on fan pages. Without whitelisting, “Liked” or shared videos appear as linked thumbnails that force the end user out of the Facebook context. 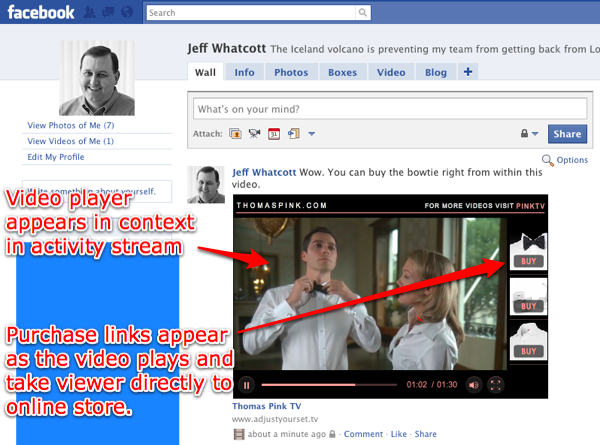 Viewing from within Facebook increases the likelihood that it will actually be watched. 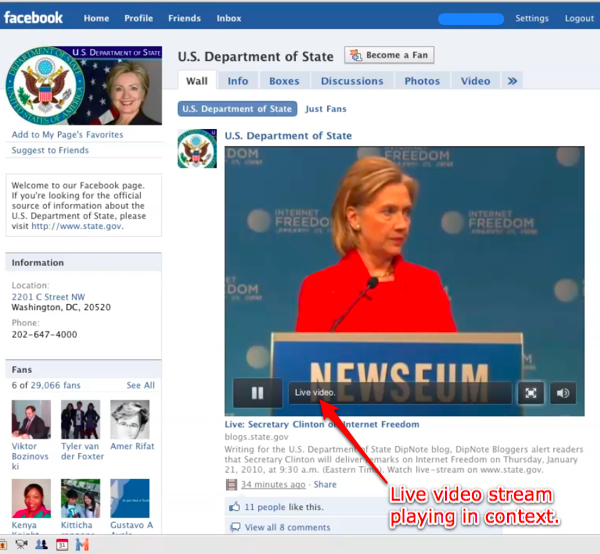 This is especially powerful with in-player calls to action (see Thomas Pink “How to Tie a Bowtie” example above) or when the video is a live streamed event (see Secretary Clinton Live Broadcast on Internet Freedom below). So does socially recommended video get watched? Yes. And we can prove it. We've been working with TubeMogul on an upcoming research report that shows people who watch a video as a result of clicking on a link found through Facebook tend to watch longer than those who found the video through other means. It just makes sense that we are more inclined to stick with the video that was recommended by people we are at least casually connected to. Taking a step back for a moment, what Facebook is doing here with the Open Graph is going to bring about what I call the "socially-validated Web." As sites and their visitors adopt these new plug-ins, it will create hundreds of billions of new connections between people and content. It's a thickening and contextualizing of the Web that could create incredible value for content owners, for consumers, and for Facebook. Better content will rise to the top quicker and the chaff will blow away faster. Every time a real person authentically validates a piece of content as valuable, the world is better off. The socially validated Web will be very bad news for spammers, sploggers, and scammers who exploit the defects of today’s largely unvalidated Web. Add up all those micro-judgements and what you have is the possibility of a new distributed neural algorithm that transcends faceless "inbound links" and other 20th century content-ranking approaches. We’re talking about a re-imagining of content discovery on par with the semantic Web, but with no infrastructure re-architecture required. Some may wonder what is so different about what Facebook is announcing today and all the multitude of social sharing buttons and links that have been growing like Web 2.0 mushrooms. The differences are critical mass scale and a connection a real-world social graph. Just sharing bookmarks and links over email or a real-time engine doesn’t forever bind the content to the social graph and make it possible to use that information to target content to users in the future. Facebook does. They are connecting all the pieces in a new way. Often that is all it takes. If the genius of search was capturing user intent, the genius of the socially-validated web is capturing preferences and relationships. Exposing this data through APIs to every site owner is a win for the user because they get to better content faster, a win for the site owner because stickiness and engagement should improve, and a win for Facebook because they get insane amounts of data that they can use to target and monetize directly on their site. I hope that all Brightcove customers are thinking deeply about how they can participate in the socially validated web to improve the reach and impact of their video content. Every site owner should be adding the features discussed in this post to their to-do list. And as the additional opportunities and implications of the socially validated Web come into focus, we'll be right there to help.